The observation of very small objects with extensive magnification is called microscopy. The needed device is called a microscope. In fields of medicine, microscopy is mainly used to observe tissues, cells, blood components and micro-organisms. Usually, certain preparative processes are required (e.g. sectioning, dyeing techniques) before observing objects under a microscope in order to maintain a clearer view and distinction of the cell structures. In conventional microscopy – light microscopy – an extensive magnification is achieved via a two-stage imaging process of the object that is being scanned. In a first step, this type of microscopy creates a reversed, realistic and magnified intermediate image by means of an objective lens, before the ocular, which the observer looks through, magnifies the intermediate image again in a second step. Thus, the collective magnification is the product of magnification through the lens and the magnification through the ocular. If a very small object is being examined or a very large magnification is required, an immersion objective is used. Additionally, a droplet of oil is applied on the microscope slide, so that the interval between object and objective is reduced and the resolution is optimized. With this technique, objects with a size of 200 nm can be made observable. For further questions about microscopy, please read our technical data or call our hotline: UK customers +44(0) 23 809 870 30 / US customers (561) 320-9162. 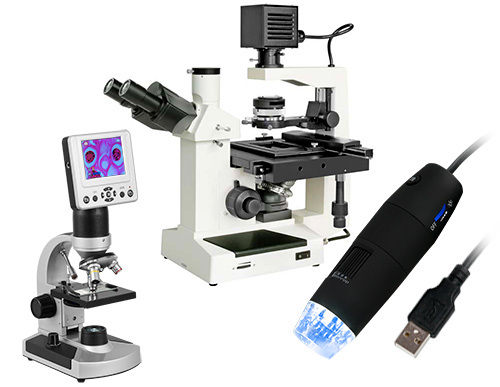 Our engineers and technicians will gladly advise you regarding microscopy or any other product in the field of regulation and control, measuring instruments or scales and balances of PCE Instruments Ltd.